My friend Judy’s cat is a calico cat. She has the beautiful coat associated with calico cats: distinct patches of white, black, and orange (tabby). Before I knew anything about tricolor cats I thought that she was just a regular domestic cat with a pretty, colorful coat. But as I became more interested in all things cat, I learned that my friend’s cat is a calico. I also learned that this type of cat can have different color patterns. Calicos do not belong to any particular breed. Instead, the term refers to their color pattern. The coloring of these felines is very specific: they must have a three-color coat. That is why they are called true tricolor cats. The most common colors are white, black, and orange or red (see below for other color combinations). Interestingly, the orange fur always has tabby markings. There is no solid orange. By the way, the patches of each color must be very distinct. Generally, the more white fur a calico has, the more distinct the other patches are. Another interesting fact is that not all tricolor cats are calicos. Tricolor coats also occur in other cat breeds. But again, that doesn't mean they are calicos. The Javanese and the Himalayan are two of these breeds. Their coats can have tricolored spots or points. However, these spots are much smaller than the patches of calicos. Other breeds seem to have a tricolor pattern when in actuality they have a bicolor pattern. For example, certain mixed breeds appear to have spots of three colors when in fact they only have spots of two colors. Interestingly, even though calicos are not a specific breed they can occur in several breeds. For example, there are instances of tricolors in the Manx, American Shorthair and American Longhair breeds. Here are more cat breeds that can have calico markings. Calicos can have different color combinations. White is always the predominant color. The second color is usually red (orange) or cream. The third color can be: black, blue, cinnamon, chocolate, fawn, or lilac (lavender). Chocolate and cinnamon occur very rarely. Why these other colors? The so-called dilution gene causes variations of the colors red and black. If a cat has the dilution gene, his/her colors will be diluted (washed out). So, the cat’s coat will have cream instead of red and blue instead of black. Similarly, the dilution gene turns chocolate into lavender and cinnamon into fawn (a paler shade of brown with a yellow tint in it). Cats with dilute colors are called dilute calicos. It turns out that my friend’s cat is a non-dilute calico: she possesses a beautiful coat of white, orange and black. -Due to genetics, most calicos are female. Male calicos are very rare, and usually sterile. 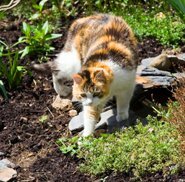 -Maryland’s state cat is a calico cat. -Some cultures consider calico cats to be bearers of good luck. Japanese sailors, for example, are said to carry calico cats on their ships as lucky talismans. -The word calico is derived from Calicut, an Indian city where a hoarse, brightly printed fabric was produced. This cloth was also named Calicut, and it was later called Calico by European traders. -Interestingly, the term calico was also used to describe brightly spotted horses. -Tortoiseshell and calico are two different types of cat. See below for more information about the differences between these two cat types. --In the UK, calicos are called tortoiseshell-and-white cats. --Callie is a popular name for calicos. Looking for names for your calico kitty? Here's a fun list of names. Before I knew anything about calicos and tortoiseshells (affectionately called torties), I thought they were the same type of cat. But I learned that there is a difference between torties and calicos. To begin with, torties have less white hair than calicos. Some torties have no white fur at all. In addition, calicos have very distinct patches of each color. By contrast, torties’ colors are blended and you can barely tell where one color ends and where the other color begins. Interestingly, some tortoiseshell cats have larger amounts of white than usual, but their other two colors remain blended. Posters – These make relatively inexpensive cat lover gifts. Paintings – For the sophisticated art and cat lover- and if your budget allows it- a calico cat painting may be the perfect gift. Here are more cat art gift ideas. Calendars – Another low-cost gift idea. Figurines – A great idea for collectors, both seasoned and beginners. Plush calico – A plush kitty is a great gift idea for cat lovers of all ages.